Yesterday . 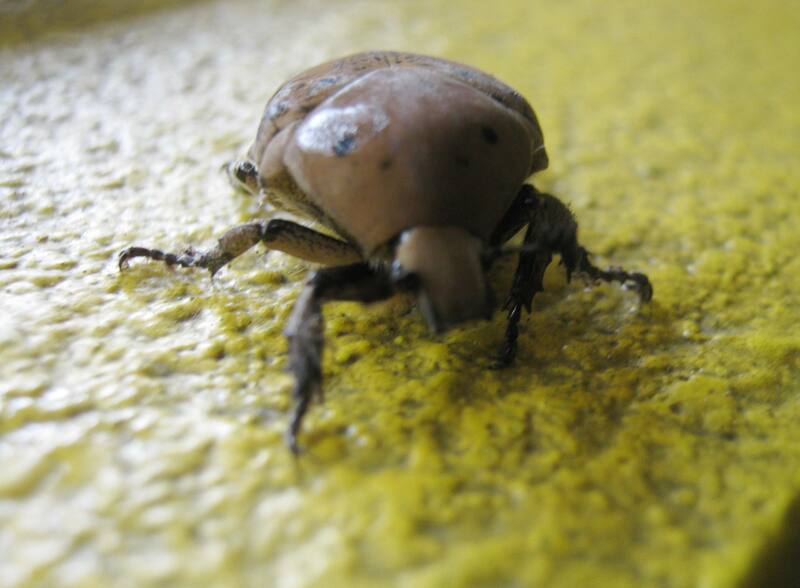 . . around mid-afternoon, and after a brief shower of rain, we got a visit from the Jamaican news bug which flew in through our window; it is not an insect that we’re afraid of. 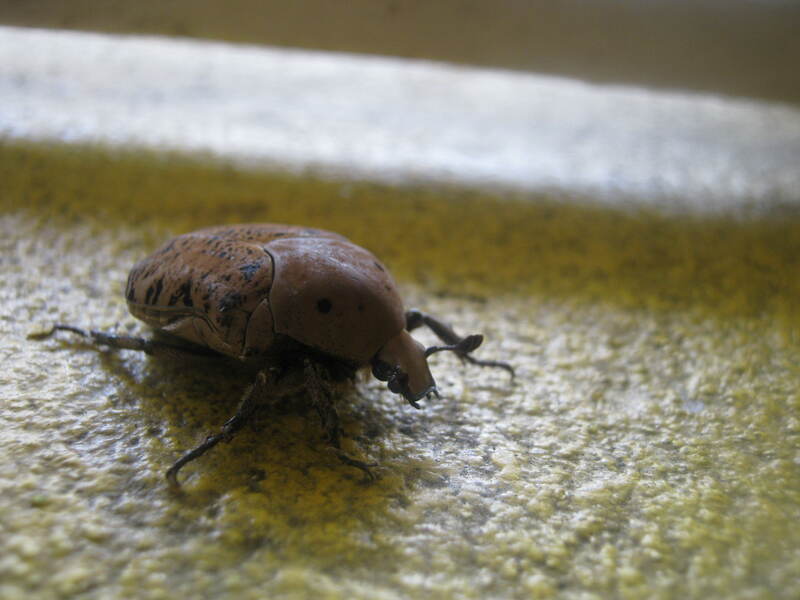 The Jamaican news bug is actually the Gymnetis lanius beetle which we rarely see around our home. 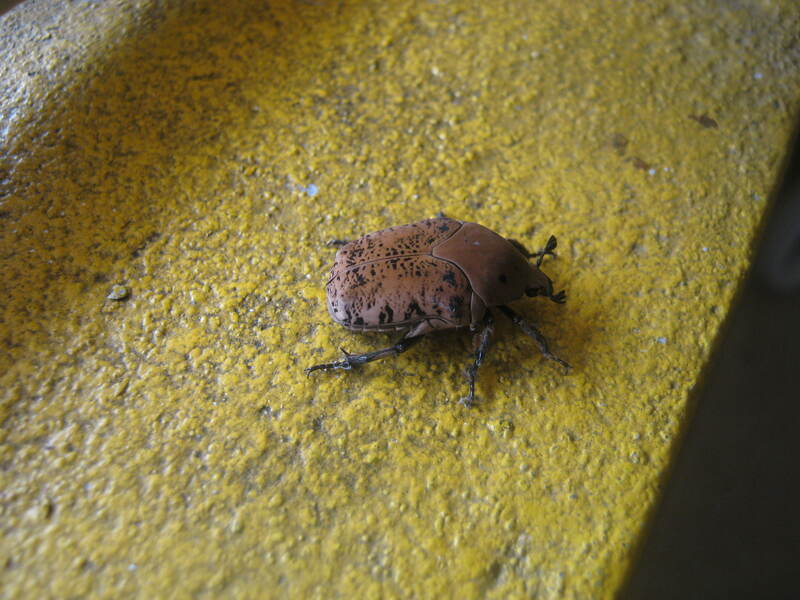 It is a brown beetle with black markings, and there seems to be limited information about it on the Internet. 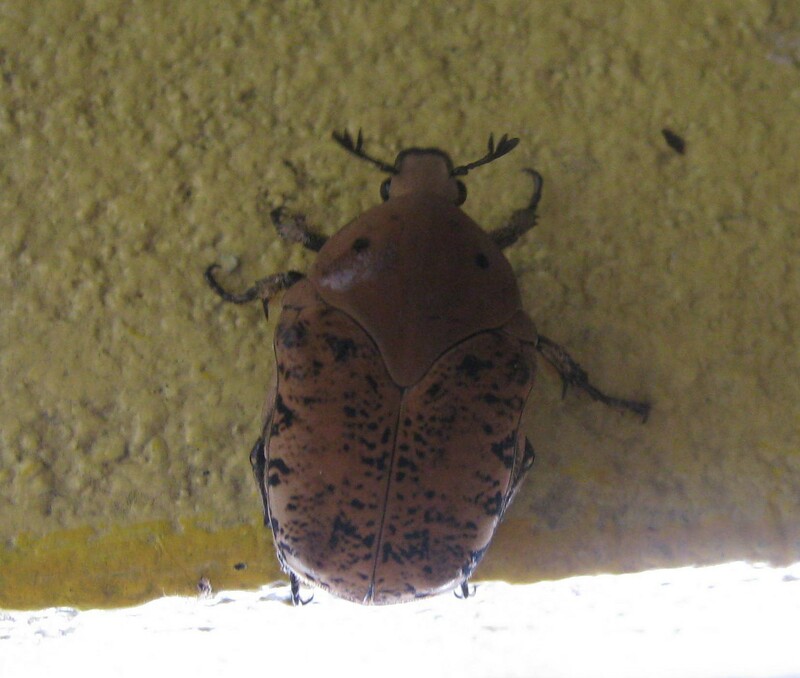 In Jamaica, when this bug alights on you or flies into your home, it is an indication that you will be getting some news soon . . . It could be good news, or bad news. 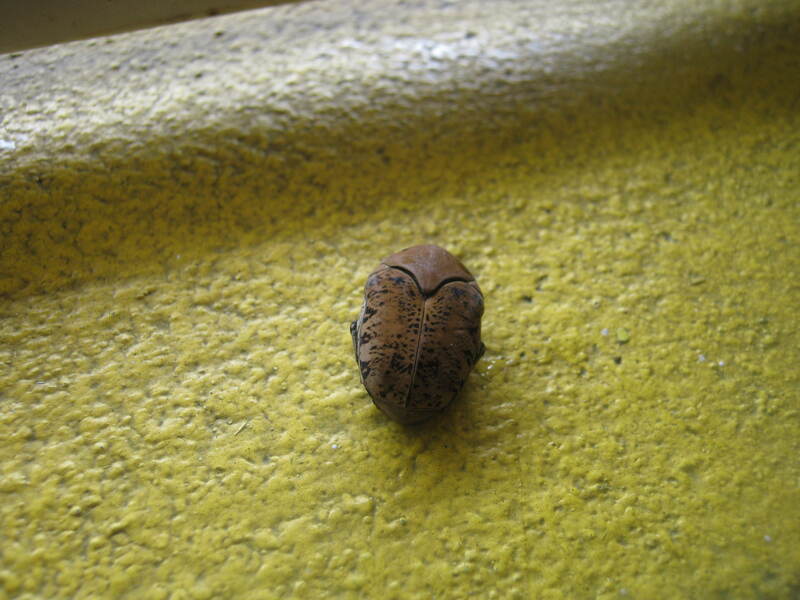 The Gymnetis lanius belongs to the Scarabaeidae family specie of beetles and subfamily of the Cetoniinae – which are Flower Chafers beetles that visit flowers for pollen and nectar. 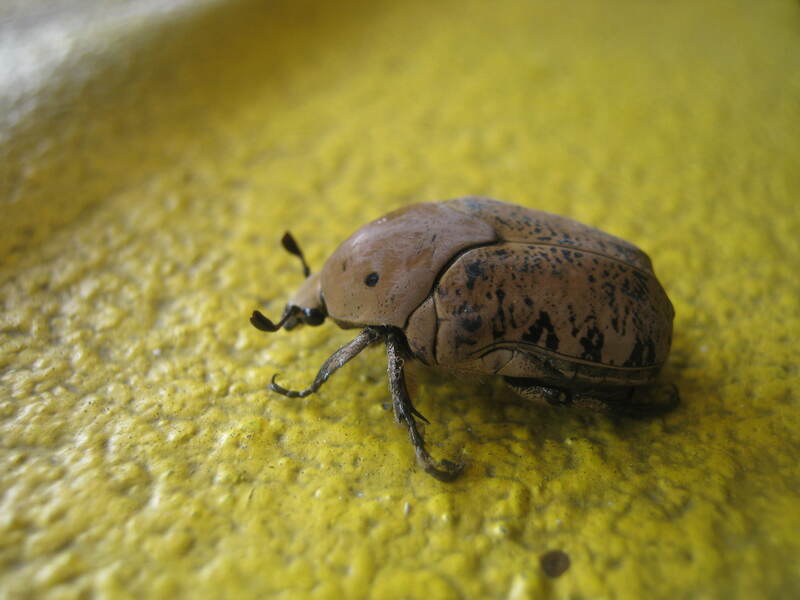 It is a stout-bodied beetle with a hardened wing cover and slightly feathery antennae. 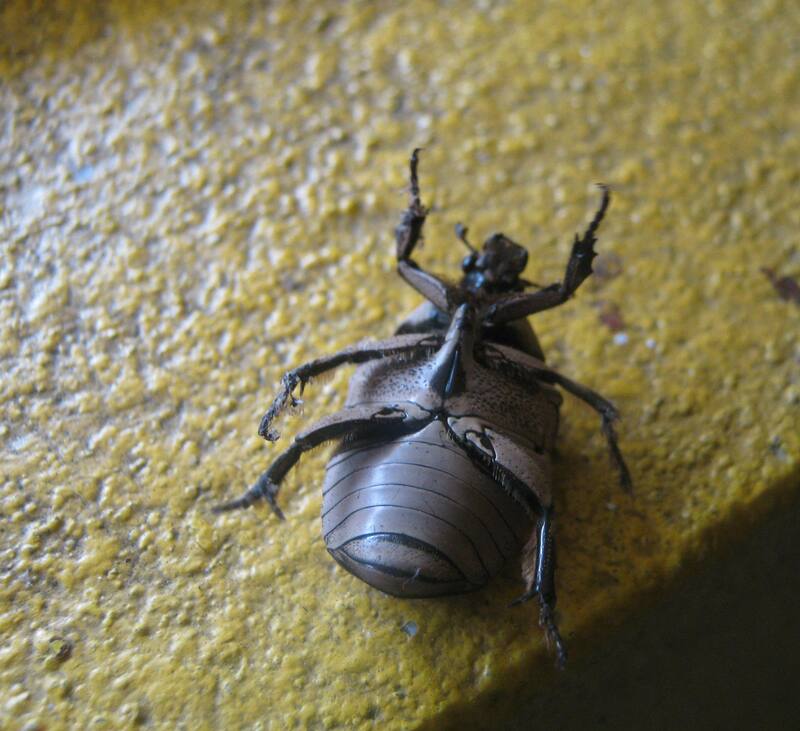 The Jamaican news bug is mostly active during the day. 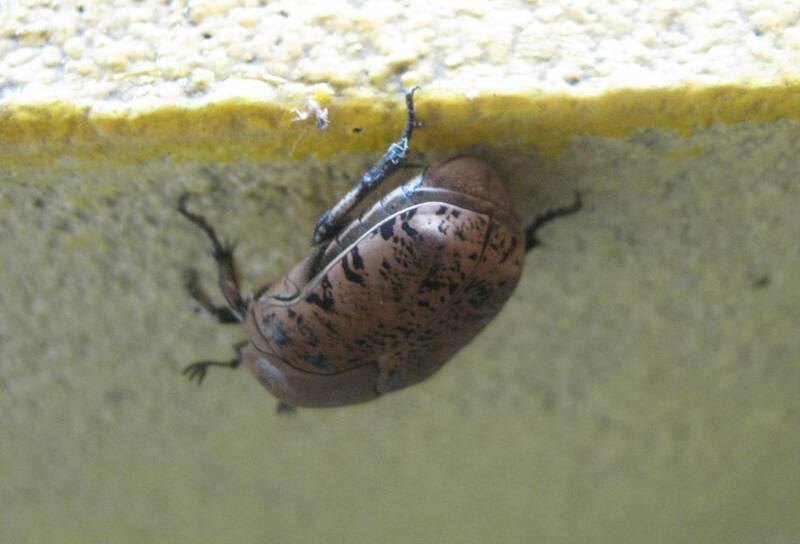 I read that you can tell that this type of beetle is the Gymnetis lanius because of the four black spots seen on the thorax. 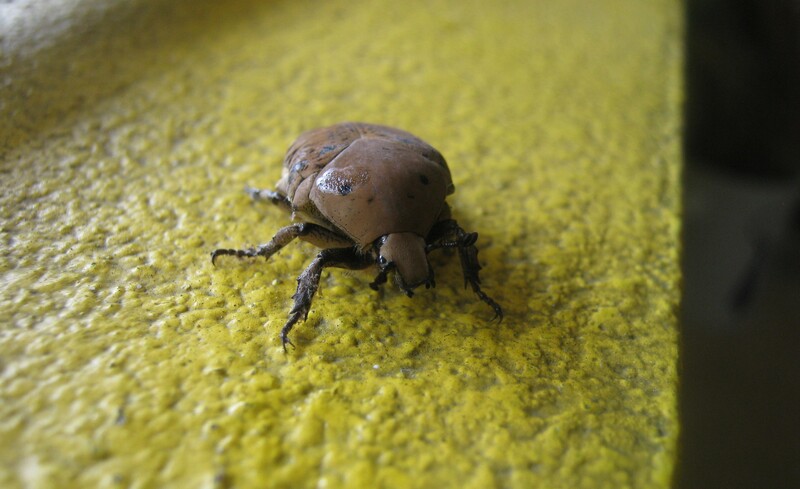 This specie of beetles is endemic to Jamaica, but there are a few related species found in other Caribbean islands. 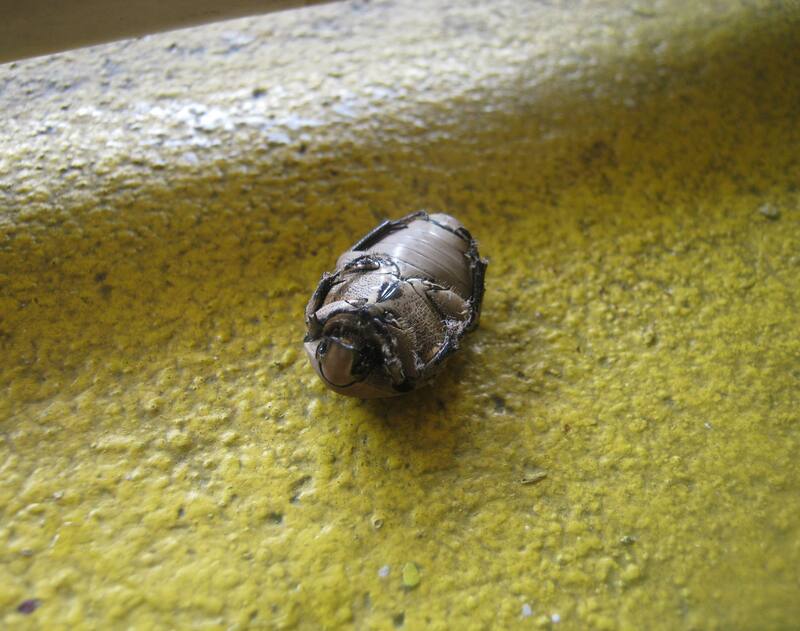 Photos of the underside of the Gymnetis lanius reveal a few abdominal segments and hairs on its legs. 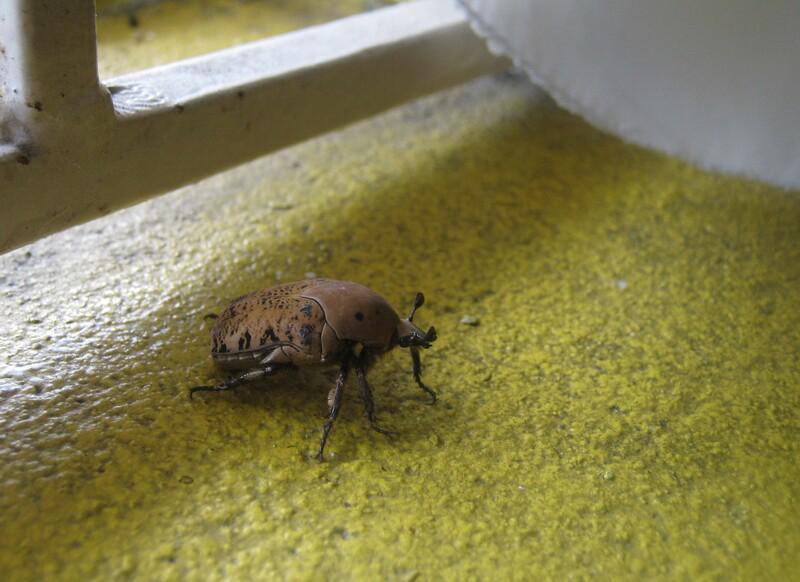 The Gymnetis lanius is not the most attractive of beetles, but the pattern of black marks on its elytra form a simple, yet interesting pattern. 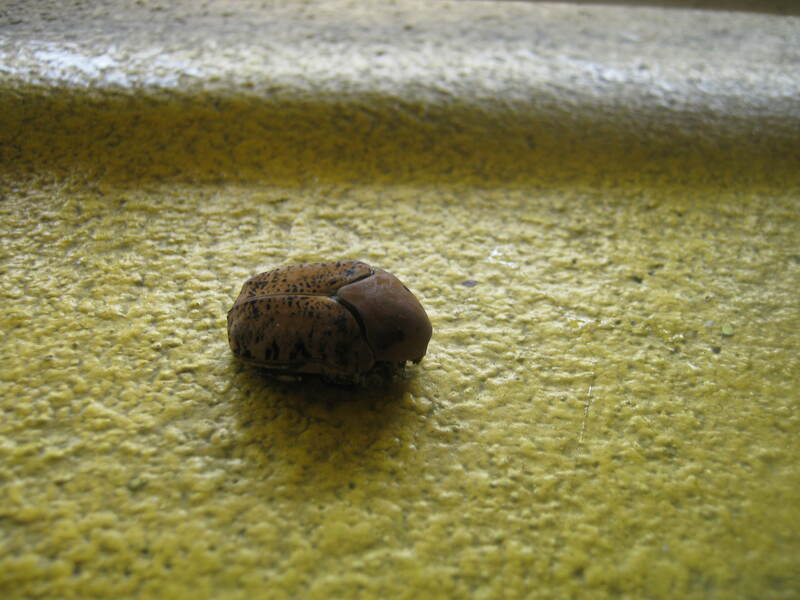 The brown and black colour combination seems like the ideal camouflage for this beetle to protect itself. 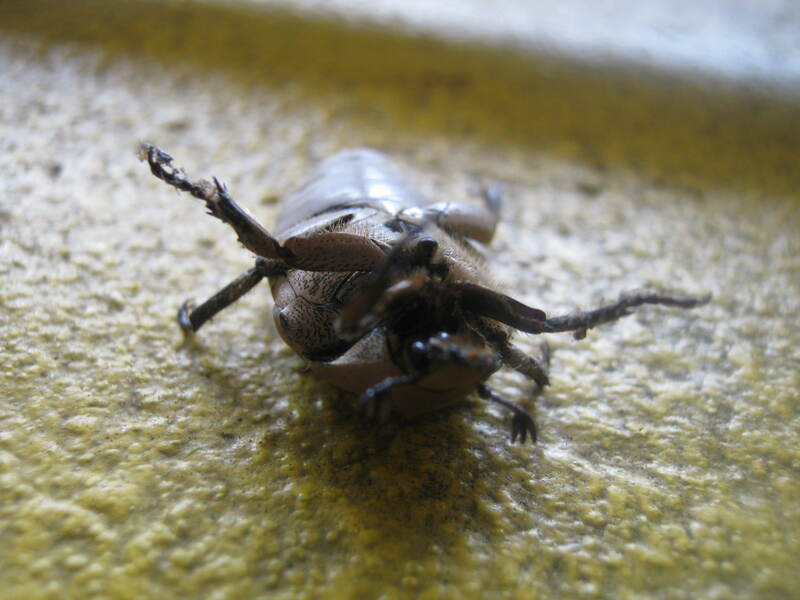 I observed that one defense mechanisms used by the Gymnetis lanius beetle is to feign death, where it curls its head and legs under and remains very still. 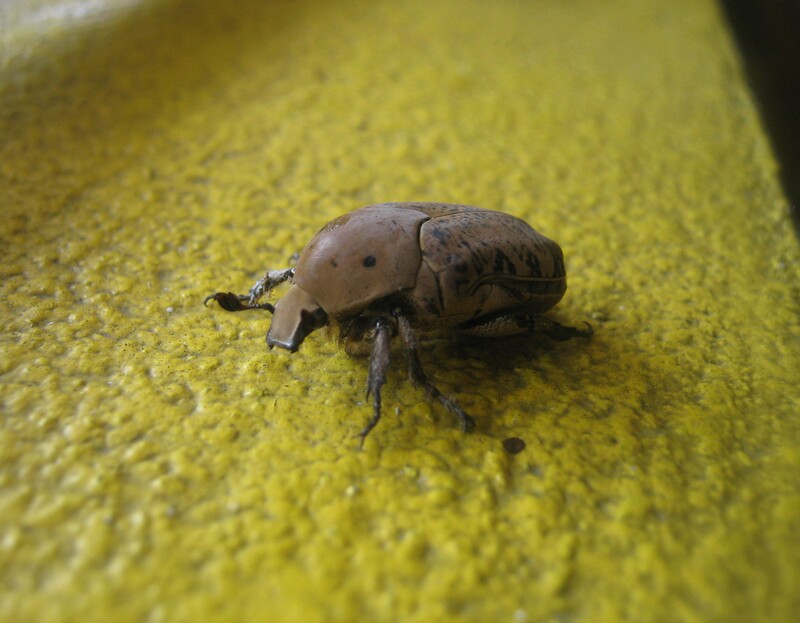 After a brief moment – when it seems to sense no imminent danger, the Gymnetis lanius gradually moves again with a plan to escape. 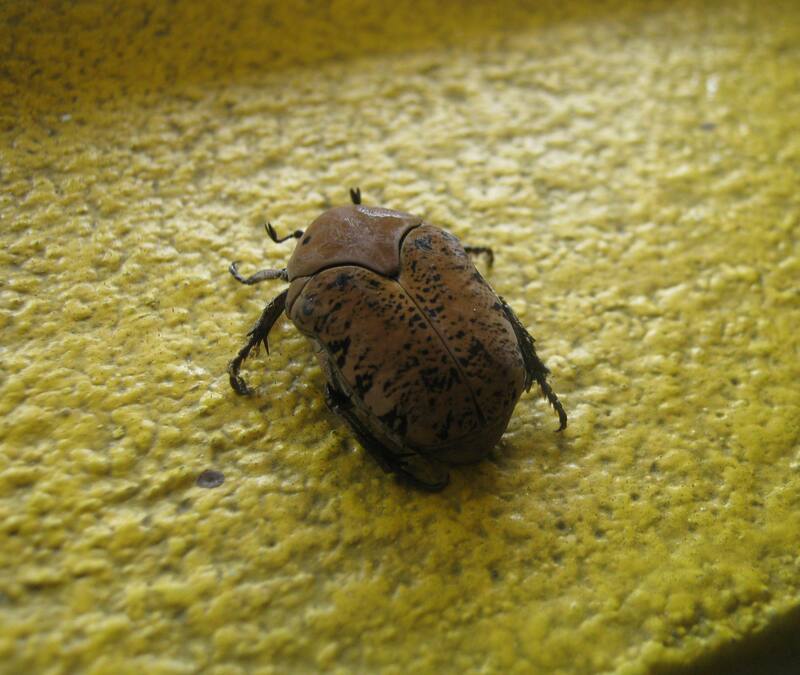 Final photo: a very scary-looking Gymnetis lanius bettle. I’m not sure if it bites. How lovely for you to have posted this information! Is it bad news if it poos in your head? It’s really based on your expectation. If you expect bad, then bad news; good . . . then good news. And if you don’t expect any news at all then you’ll get no news, like what happens to me most times when I see this bug.